Stocking was born with deformed legs that were corrected by surgery. His story has gone viral. Life has been a bit crazy for Stockings the kitten lately. And, it’s not because he’s become an Internet sensation with his story going viral. No, it’s much more simple than that for the little Chicago kitten born with deformed legs and given a second chance by Tree House. Stockings’ life has been a bit crazy because the kitten that once couldn’t walk has recently learned how to jump. He already had the climbing thing down pat. And, he’s making the most of his newly found jumping talent and settling into a normal kitten life. Stockings has recovered and is learning how to be a regular kitten...he's succeeding. Stockings’ story started last fall when he was rescued by Tree House from a suspected hording situation. 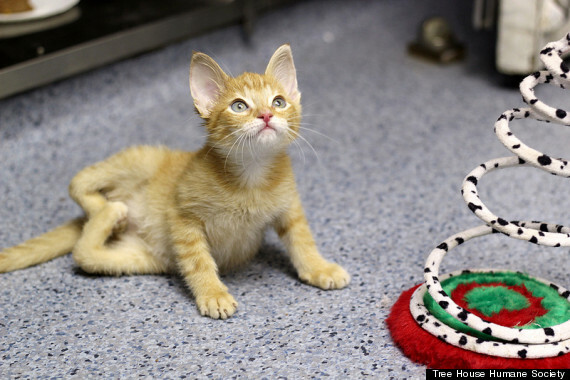 He couldn’t walk or stand because he was born with deformed back legs that were shaped like a “W”. He also had an upper respiratory infection. At many places, that would have been the end of Stockings. Not at Tree House. Stockings the spunky kitten was about to get a couple of extra lives. 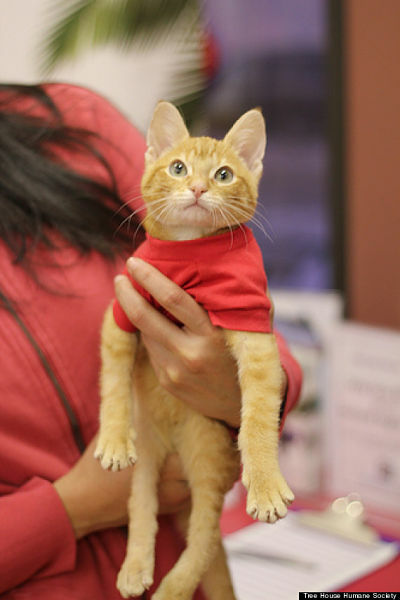 Chicago’s oldest, largest, cageless no kill shelter specializes in helping cats that need them the most – the sick, injured, those born with special needs. Stories like Stockings happen there all the time. Dr. Lynda Ewald, the shelters Director of Veterinary Services consulted with Dr. Steve Neihaus at Chicago Veterinary & Emergency Specialty Center for help. The two organizations had collaborated in the past and he had an idea. Stockings’ tendons were to be cut during surgery, allowing the legs to be re-aligned and extended. Splints would be placed on his legs during recovery. It would take several surgeries to get Stockings on the mend. Stockings is walking and jumping these days. Photo courtesy of Tree House Humane Society. 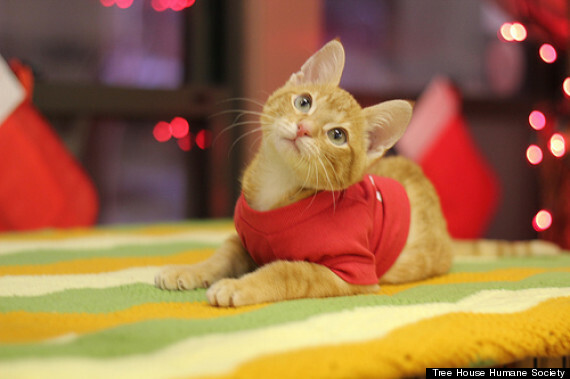 In most cases, kittens and cats that have surgery at the veterinary hospital return into foster care at Tree House. Because Stockings needed to be watched so carefully, it was decided that someone from the veterinary hospital would foster the kitten to keep tabs on him at night and return him for observation during the day. He officially joined her family just before Christmas. In the end, Stockings needed four surgeries and originally it was thought he may need physical therapy to learn to use his legs and develop properly. That hasn’t been an issue at all. Cherry says he’s been making all kinds of progress on his own and the kitten energy and curiosity has served him very well. Stockings was adopted by his foster family in time for Christmas. He's now making the most of his forever home. Cherry was somewhat familiar with the work of Tree House since they had worked on cases in the past with the Veterinary hospital where she worked. Now, she’s very glad that the organization doesn’t shy away from the harder cases. 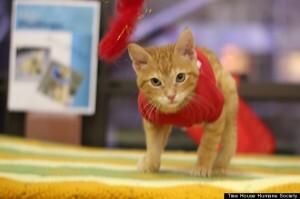 “At a lot of shelters, a kitten like Stockings would have been euthanized. I’m so happy that he landed at one of the places that would look for alternatives for him to live a happy life,” adds Cherry. Many of us in Chicago have been in on that little secret about Tree House for a long time. I’m so excited that as of this week, the rest of the world finally knows as well. As a long time supporter of Tree House, it's been exciting to see one of their happy endings go global. A feeling shared by fellow ChicagoNow pet blogger Steve Dale this week. If you'd like to help Tree House continue their good work, you may donate online. See Stockings in action below.